Upon entering the newly-opened Madison on Park, we felt something special, an inviting warmth. It's difficult to describe, but sometimes a restaurant just feels comfortable, like home, and you know that it's going to be a neighborhood gathering place. 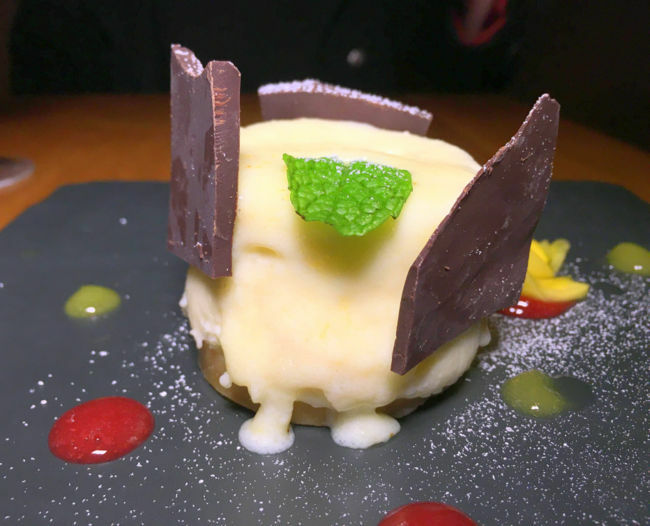 After sitting down to sample a delicious dinner at University Heights' newest dining destination, we are confident in saying that the eatery has a bright future ahead. Madison offers an eclectic menu, great value, plentiful portions and a Zen-like atmosphere. Madison is a collaboration of experienced San Diego industry insiders. The owner and managing partner Jeffrey Fink is the guy behind M-Theory Music and FLUXX nightclub, as well as a longtime attorney who kindly indulged us picking his brain with respect to our own practice. The menu is designed by Chef Mario Cassineri, partner and executive chef of BiCE Ristorante in downtown San Diego. Chef Tony “G” Gutierrez, formerly of BiCE Ristorante, La Strada, and Opera Café, commands the kitchen at the Madison on a full time basis, and the cool-as-sh!t General Manager Matt Sieve, formerly of Isabel’s Cantina and third generation restaurateur, takes care of Madison’s day-to-day operations. The restaurant also features a full bar with cocktails designed by mixologist Dan Dufek, as well as a generous selection of local beers and a tailored wine program. Taking over the former Lei Lounge, Madison transformed the space into a relaxing indoor-outdoor oasis. Upon entering the Victorian-era storefront, the restaurant presents a sophisticated bar and lounge area lined with plush booths. 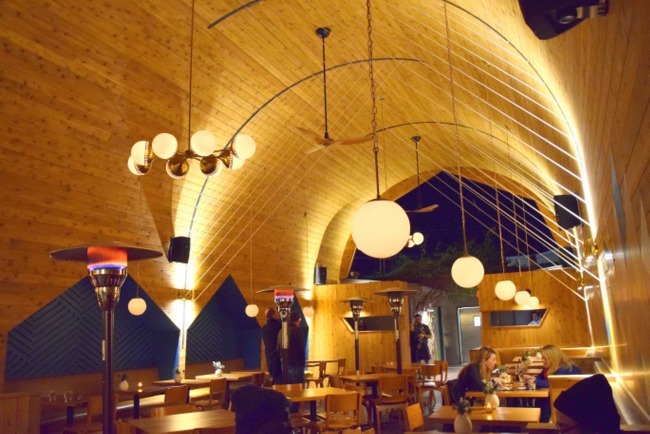 Just beyond the bar, the main dining room offers al fresco seating under a gorgeous vaulted, cedar-lined, archway ceiling. The musical background of the creative team inspired the design of the space. Rope installations, reminiscent of guitar or harp strings, are abound in the cavernous dining room, as well as partitioning the cozy booths in the bar area. The restaurant also boasts a top-of-the line sound system (imagine the acoustics!). Madison's concise menu features an enticing variety of small plates, salads, entrees, and a few desserts, with everything on the menu priced under $20 and designed for sharing. We began with the tuna tartare with shrimp tempura, tomato, cucumber, sesame seed and crème fraîche ($12). 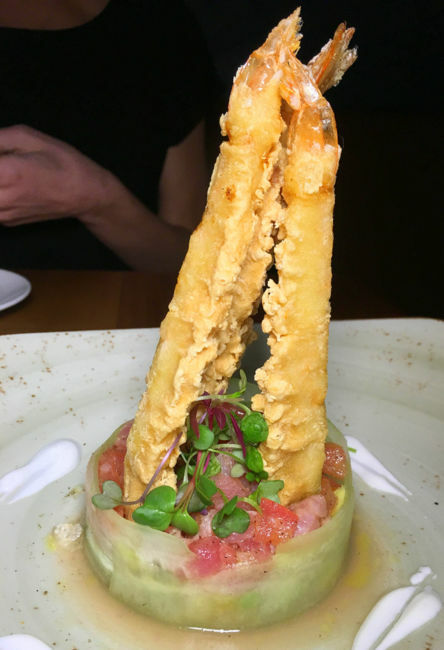 We were blown away by the presentation when the dish arrived at our table and used the shrimp tempura like chips to scoop of the mix of tuna and tomato. The saltiness of the tempura elevated the fresh flavors of the tartare, balanced by the creaminess of the crema. From the salad menu, we ordered the baby beet salad with red and gold beets, spinach, asparagus, lentils, garbanzo beans, burrata and a balsamic drizzle ($12). 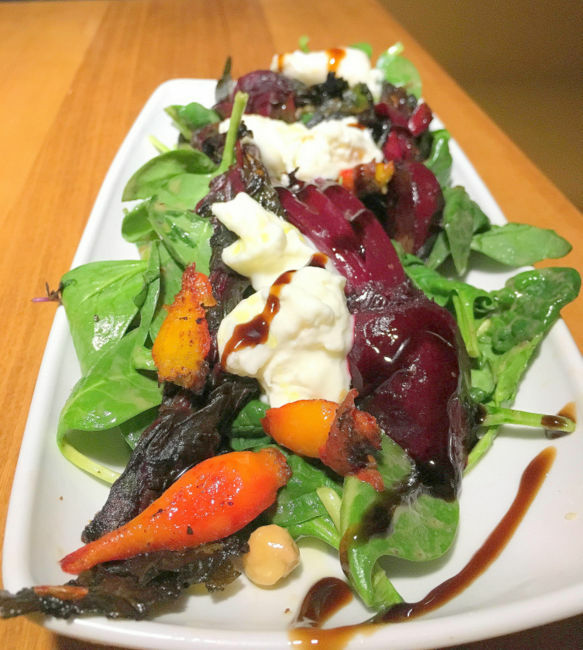 This hearty, meal-portioned salad was excellent and was one of the first times we saw the beets served roasted with stems on, as well as fried pieces of the leaves. We devoured the whole thing in all of its earthy glory. 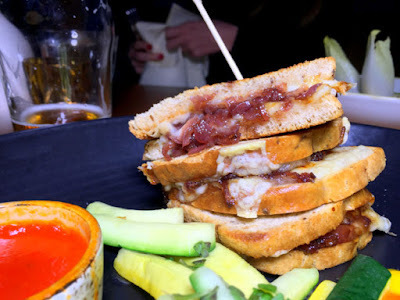 For my entree, as a kid at heart, I could not resist the Rye Emmentaler grilled cheese, a three piece sandwich, skewered and stacked high, and filled with onion jam, sided by an exquisite honey bell pepper sauce as well as zucchini 'fries' with mint ($13). My only complaint - I longed for a bowl of the honey pepper sauce to dump over everything. 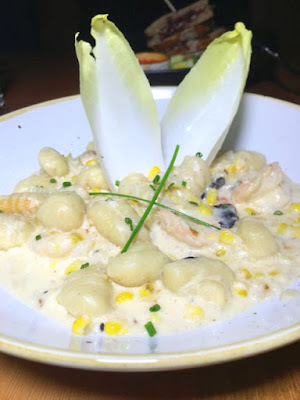 Lady SanDiegoVille, a fool for all things truffle, decided on the velvety and rich seafood gnocchi with crab, jumbo shrimp, corn, truffle cream sauce and endive ($18). Upon service, our waiter sprayed truffle essence atop the dish, creating a fantastic aroma and an invitation to dive in. The sweetness of the lumpy crab and fresh corn balanced the rich creaminess of the sauce, but still, the dish is so dense and filling, we recommend it is shared. Desiring something sweet to finish our meal, we ordered the Torte di Ricotta, and although the raspberry coulis and chocolate pieces fulfilled the craving, we felt that the ricotta could use a bit more sugar and a bit more whip to truly complete the dessert. We will certainly return to Madison, as it offers immense value in a cozy environment, and is great for groups. 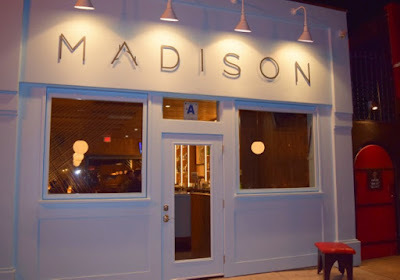 Madison is located at 4622 Park Boulevard between Madison and Adams Avenues and is open daily from 4pm to 2am. For more information, visit madisononpark.com.